Thanks for stopping by to see my version of Rene's fabulous new quilt pattern! I was so excited to be part of the group who pattern tested this quilt. And it's even more exciting to see everyone's version! I made the baby version. Rene's instructions and illustrations are very straightforward, well-written and easy to understand. The best part is that there are very few seams you have to match up. It's no secret to anyone who knows me that I love working with solids. I found my inspiration with some solid scraps and the color wheel that my husband, Mark, keeps in his fused glass studio. When choosing the colors, I just went around the color wheel, choosing first hue, or the clear colors at the top, then the tint--the color with white added, then skipped down to the bottom to the shades--the color with black added. That gave me enough to go all the way around. For the center spokes I had a rainbow jelly roll of tone-on-tone prints. Want a little peace in your life? Here is the schedule. I hope you will check out everyone's version and leave a comment for a chance to win a copy for yourself! 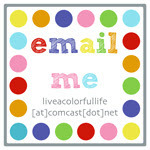 Wednesday, January 23 - Cindy at Live a Colorful Life --you're here today! I'd love to know what color combinations you are currently loving. The giveaway will close on Friday, February 1. What a unique way to make a color wheel, Cindy! Rene's pattern is so clever. I like your use of more solid appearing colors. Lovely?!! It's no secret I am a big fan if the rainbow, so of course I love your quilt. Remember, don't count me!! I've already won!!! Isn't Rene' great?! The solids are wonderful. Love how you put them all together. Don't enter me, I tested too. Just wanted to drop by and see your beauty. I am loving the solid in blues, greens, aquas and grey right now. Thank you Cindy for testing the peace pattern. Your Peace Around the Color Wheel quilt is just brilliant! I love how you used colorful solids around the outside and tone on tone colored prints in the middle. It's so pretty! 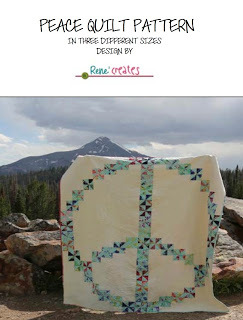 Very sweet color wheel Peace Quilt Cindy! Beautiful! I love your colour progression, Cindy! It's a beautiful pattern and i love your version. Beautiful! I always love how you use solids. Very cute profile picture!! oh, what a fantastic quilt. Love your version! Love the pattern and your version of it! Thanks for the chance! It looks beautiful and I love the color wheel idea. Your Peace Baby quilt is so fun! Love the color wheel idea. 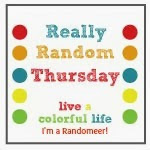 It's been fun seeing the variety others are making for Rene's blog hop. It was a great pattern to test, wasn't it! It's beautiful, Cindy! I knew you would do something striking and I figured it would be with solids! Well done! That is just so you. It's beautiful - I love seeing what everyone's been doing with Rene's pattern! I love your take on Rene's pattern! The colours and design match perfectly! Great quilt! Few seams to match up really talks my language!!! Wonderful done in the solids! I really love this quilt pattern! I like how you incorporated the color wheel into the design. Great job. like your use of the color wheel! as always, my fav color combo is green [any green] and light silver grey. and since i love my olfa circle cutter, i'd make this fabulouse pattern in circles of green on a silver grey background, baby size, or lap quilt size. thanx for the chance to win a copy of the pattern. Oh I love a good rainbow! Beautiful, Cindy! I adore your rainbow version! Very cool! I tend to be drawn to aqua, lime and gray but am itching to do something "rainbow-y". Because that surely is a word, lol! Thanks for a chance! Not entering the giveaway, but I just had to pop in and say that your interpretation of Rene's pattern is fantastic. Love how you did the colors! Cindy - I love, love, love your peace quilt. You continue to amaze and inspire me with your use of solids. Beautiful!!!! Great quilt. I love the symbol and the colors! Thanks for the giveaway! What a lovely color wheel version of Peace! For color combinations, I usually fall in love with any cute fabrics in aqua/blue. Thanks for the chance. Oh, I love your solids colour wheel version! Have you got a quilting plan yet? How big is this baby size Cindy? Great color wheel version. Thanks for sharing. I LOVE this pattern!!! I can see it in so many different fabric options! Just love it! I love your version too! I'm into orange and grey right now.